A short and shallow experience. side from two recent Wiiware spin-off games, the Final Fantasy Crystal Chronicles series has relied primarily on cooperative action-RPG game play. Its latest installment, The Crystal Bearers, forgoes these traditions in an attempt to become a single-player action- adventure closer to a Legend of Zelda than a Final Fantasy title. The game's story and characters in particular make a point to avoid past narrative conventions, as there are no angst-ridden teens, revenge plots or evil empires. At the outset, protagonist Layle and his mercenary companions are out only for cold hard cash, and will quite happily deceive and manipulate others into getting what they want. 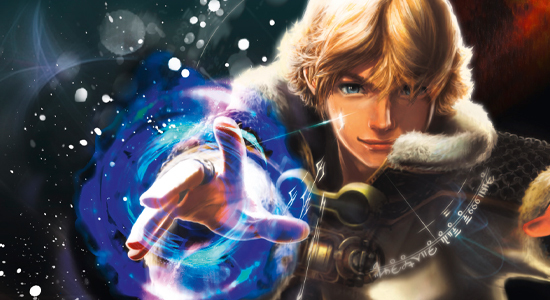 Together with a focus on the politics and racial tensions between the four tribes of Crystal Chronicles, The Crystal Bearers ends up feeling a lot more down-to-earth than you might expect from Final Fantasy. While the script and voice-acting aren't as sturdy as say, Persona 4, the story is definitely one of the stronger aspects of the game, especially for returning Crystal Chronicles fans. An offbeat story: no angst-ridden teens, revenge plots or evil empires.The core game play comprises of a telekinetic mechanic similar to the gravity gun from Half-Life 2. Taking control of Layle, a crystal-bearer imbued with these powers, primary combat revolves around picking up and throwing objects to cause damage to enemies. Though an intuitive use of the Wii's pointer capabilities, there isn't much variety or challenge to this as most encounters can usually be won by simply throwing anything and everything you can find at your opponents. The game also rarely takes advantage of these abilities outside of battle, missing a fantastic opportunity to indulge in some Half-Life 2-style spatial puzzle-solving. While combat is decent, its simple, unchanging nature reveals The Crystal Bearers' biggest problem. Outside of the story, the game has little sense of progression due to the lack of any underlying mechanics. There's never any meaningful way to upgrade Layle, since all the powers you'll need are available from the start of the game. You'll never pick up weapons or armor, and there are no additional abilities to be learnt. You can find materials to create basic accessories to boost Layle's attributes, but they don't seem to make a distinct impact on his performance and aren't required to beat an already easy game. Along with money, these materials provide the only forms of loot in the world, meaning side-quests and additional mini-games become rather pointless unless you consider superficial achievement-like medals a reward. As a result of all these underdeveloped mechanics, the sizable and often beautiful open world, which begs to be played around in, ends up feeling largely redundant. Offering little incentive for side-quests, the beautiful open world ends up feeling largely redundant.Mini-games and events are a big part of The Crystal Bearers, and usually crop up during important moments in the story. Though the words "mini-game," "Wii" and "Final Fantasy"' might conjure up images of dread for many players, on the whole they're pretty well done here. They're simple and help break up the monotony of combat, as well as usually fitting the action happening on-screen. Some involve a twist on Layle's abilities, like the cart escape scene where the player has to pull approaching soldiers off the back of their chocobos. Others are simpler still, like the downhill surfing that requires only left and right actions on the analog stick to maneuver. In fact, the game probably would have benefited from more of these set piece scenes, as the cinematic airship attack and crash-landing opening scenes proved to be one of the highlights of the game. The Crystal Bearers is also pretty short both for an action adventure and a Final Fantasy title. I made it to the end credits in less than ten hours and while I didn't fully explore all the environments and beat all the side quests, I can't see there being any more than five more hours of play left in the game. And that's only if I were to get obsessive-compulsive about earning all the meaningless medals. Here we go again: mini-games help break up the monotony of combat.Presentation is one of the few areas that the game doesn't disappoint in. The soundtrack — one of the most important elements of a Final Fantasy game — provides a surprisingly eclectic mix, maintaining the celtic stylings of the Crystal Chronicles series, but also infusing other folk genres like old-time, jazz and Spanish jota. Combined with the highly detailed graphics that might just rival Nintendo's own Twilight Princess, this is one of the better looking and sounding fantasy worlds on the Wii. In the end, The Crystal Bearers seems like it was created as a more accessible alternative to something like a Zelda, with its simple combat and numerous mini-games. But without any substantial character or game play progression, it ultimately ends up a short and shallow experience. If it weren't for the considerable production values behind the presentation and storytelling, this would have been more appropriate as another WiiWare title rather than a full-priced retail game. did u try using any monster abilities? and by the time u went to the final boss, about how many myrrh fragments had u gotten?